The Aviation industry is one of the most security-conscious in the world, with a propensity for strict regulatory frameworks, exhaustive security protocols, and employee screening to rival even national security. But, despite these extraordinary measures, if there’s ever a sector that finds itself dragged to the frontline of preparedness and safety debates, it’s Aviation. While flying remains the safest method of transport, aircraft incidents often have an oversized impact on the public consciousness. Horrifying images of aircraft wreckages are simply more powerful than informed statistics, and the public needs the reassurance that stringent emergency and crisis management processes are in place. To shed some light on why, including pertinent real-life examples, here’s a handful of the industry's most frequent incidents and crises. Foreign object debris (FOD) is perhaps one of the least well-recognised public threats to aircraft, but this doesn't mean its severity shouldn't be called into question. 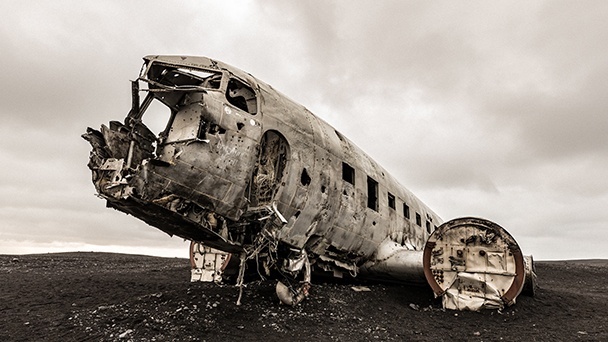 Small debris, loose objects, wildlife, and even stray humans have the potential to cause irrevocable damage to aircraft which threatens not only structural integrity, but also the lives of all passengers and crew on board. Perhaps the most famous of all FOD-related disasters is the Concorde Crash in 2000. During Concorde's takeoff run, it ran over a piece of debris reportedly from a recently-departed aircraft. This led to a tear in one of the tyres, sending a large chunk of debris into the underside of the plane’s wing. The resultant shockwave ruptured a fuel tank, igniting the aircraft in the process. Having already reached take-off speed the Concorde became airborne but rapidly lost power across all engines. Despite the best efforts of the crew, the Concorde stalled mid-air, eventually crashing into the Hôtelissimo Les Relais Bleus Hotel, just metres outside the airport boundary. All the passengers and crew, and four employees of the Hotelissimo hotel were killed in the incident, leaving the total death-toll at 113. Aircraft collisions are often the most severe plane incidents owing to the relatively high velocities involved, the likelihood of subsequent impact with the ground, and severe or total aircraft damage post-collision. Although a rare occurrence in general due to the vastness of open space available, collisions often happen near or at airports, where large volumes of aircraft are spaced more closely than in general flight. This was the case in the Tenerife airport disaster, which occurred back on March 27, 1977, and remains the second most deadly aviation accident in history. A total of 583 people lost their lives when a KLM Boeing 747 attempted to take off without flight clearance and collided with a Pan Am Boeing 747 at Tenerife North Airport (formerly Los Rodeos Airport). A contributing factor was the dense fog present that day, which ensured that the KLM flight had no way of seeing the Pan Am aircraft on the runway until immediately before the collision occurred. The impact and resulting fire killed everyone on board the KLM plane and most of the occupants of the Pan Am plane, with only 61 survivors. Aircraft sabotage is any action aimed at preventing the aircraft from following its scheduled flight plan. Aircraft are primary targets for terrorists on account of their proximity to lots of people and the ability to create mass panic quickly. This most often includes hijacking attempts, the threat of a bomb or weapon, or, in rare instances, the shooting down of the aircraft itself. While aircraft security is exceptionally thorough, this rigorousness has led to terrorists coming up with more creative and subversive ways to breach security protocols. This was the case on September 11th, 2001, the deadliest aviation-disaster of any kind. On the morning of September 11th, four separate transcontinental flights were hijacked by Al Qaeda-affiliated terrorists. Each flight targeted a major American landmark, with three out of the four hitting their mark. These included the destruction of the World Trade Center in New York City, as well as considerable damage to West side of the Pentagon building in Arlington County, Virginia. The total death toll for the September 11th attacks reached 2,977, excluding the 19 terrorist hijackers. For fatal accidents, one calculation puts the primary cause as "pilot error" in 50% of all cases. Controlled flight into terrain (CFIT) is one of the most common scenarios according to the International Civil Aviation Organization (ICAO), with poor visibility, a navigation mistake, or a more fundamental pilot error leading to the aircraft being piloted into the ground, water, or mountain. An notable example of this was Eastern Airlines flight 401, which smashed into the Florida Everglades in 1972. The incident happened after all the crew became obsessed with finding why the landing gear indicator – a light identifying when the nose gear is correctly locked – had not illuminated. While they investigated, they failed to notice the ‭autopilot had been accidentally switched to a setting that allowed a steady descent, letting this error go uncorrected until it was much too late. The aircraft crashed at approximately 227mph, taking the lives of 101 and injuring a further 75. Equipment failures still account for approximately 20% of aircraft incidents, despite vast improvements in design and manufacturing quality in recent years. Mechanical failure was the official verdict of Japan's Aircraft Accident Investigation Commission after the Japan Airlines Flight 123 crash landed just outside of Tokyo shortly after take off. On Monday, August 12, 1985, the Boeing 747SR suffered a sudden decompression twelve minutes into the flight. This led to the severance of all hydraulic fluid lines, resulting in a total loss of control and stabilisation. After oscillating up and down, repeatedly gaining and losing height, the aircraft entered an uncontrollable descent into the mountains, where it disappeared from radar. The total number of fatalities was 520. It remains the deadliest single-aircraft accident in aviation history. Due to the uncontrollable and changeable conditions that aircraft routinely travel through, the weather remains one of the most substantial risks impacting aircraft safety. Among different weather hazards, thunderstorms, microbursts, mountain wave turbulence, clear air turbulence, wind shear, poor visibility and fog are often the most severe. This was the case in 1982, when a microburst brought down Pan Am flight 759 from New Orleans International Airport, killing 153 people. Seconds after takeoff, the weather event caused decreasing headwind and downdraft so fierce that there was barely time to react before the aircraft descended and struck a line of trees at an altitude of only 15 metres. The aircraft continued its descent, hitting yet more trees and houses before being completely destroyed by the impact of the crash, the proceeding explosion and ground fire. A total of 153 people lost their lives (all 145 passengers and crew on board and 8 on the ground), and another 4 people sustained injuries. A bird strike – sometimes called a bird aircraft strike hazard (BASH) – is a collision between an airborne animal such as a bat or a bird and an aircraft. Popularised within the public consciousness by the film “Sully” – a Hollywood-infused retelling of the US Airways Flight 1549 – bird strikes can pose a significant threat to flight safety and have caused a number of accidents with human casualties. Most accidents occur when a bird (or birds) collides with the windscreen or is sucked into the engines of an aircraft. While aircraft are designed to withstand such impacts, multiple bird strikes – or hitting large birds such as Canada geese – can and have caused serious accidents. Canada Geese were the culprit in the case of US Airways Flight 1549, which gained renown as “The Miracle on the Hudson”. The plane struck a flock of Geese at an altitude of 2,818 feet (859 m) about 4.5 miles (7.2 km) north-northwest of LaGuardia airport on January 15, 2009, a collision that resulted in both engines shutting down and not able to be restarted. Taking the only action left available, Chesley (Sully) Sullenberger glided the plane to a ditching in the Hudson River off Midtown Manhattan. In this instance, all 155 people aboard were rescued by nearby boats, and there were few serious injuries. The risks associated with the Aviation industry are significant and broad, and the impact of these threats can be monumental and, in many instances, lethal. Despite the sector having the most rigorous safety checks and public-facing security policies outside of the Defence industry, the threat of aircraft incidents can never be extinguished entirely and to mitigate the fallout, emergency planning is essential. Contingency planning is about assessing enterprise risk and putting processes in place to deal with a potential emergency. It aims to ensure that everyone who has a role in handling a crisis knows their responsibilities, tasks, and the authority they operate under. A crisis management plan won't prevent disaster, but it will help to control the fallout should one occur, and hopefully save lives as a result. For practical guidance on what information to include in an Aviation contingency plan and how it should be structured – download our free ebook. Yngve is Chief Communications Officer for One Voice and responsible for both the Norwegian and English language blogs. He graduated in Economics and Management from the Norwegian Business School and was the founder of a communications consultancy assisting companies, both large and small, to achieve their communication goals. Yngve is part of the management team at One Voice with responsibility for designing and directing their communications and marketing strategies. In addition he is responsible for communications during emergencies as part of the of the crisis management team.